With kids going back to school, it’s the perfect time to revamp your fitness routine. 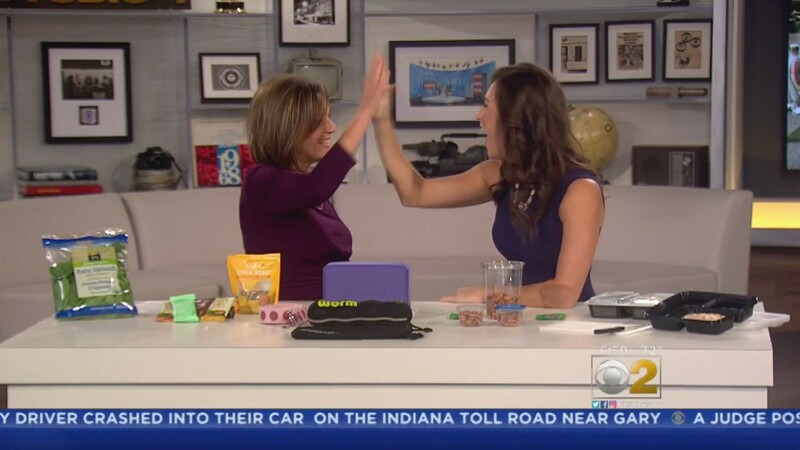 Weight Loss Coach and Fitness Expert Stephanie Mansour stopped by CBS Chicago to provide some new and easy habits that help you shape up and stay in it to win it! A large percentage of my private weight loss clients are busy career women. A common point I like to touch on is that staying well-nourished is equally as important as making the time to workout. When you’re constantly on the go it can be hard to find time to slow down and cook yourself a healthy meal. That’s why my first habit recommendations to start with is–meal prepping! To smoothly integrate meal-prepping into your weekly habits–plan in advance. Plan a menu, list out all ingredients needed, then pick a day when you are less busy to go grocery shopping. Don’t forget the list!! Cook your food, then take it a step further and portion the food out in individual containers. Do this so that when you’re rushing out the door in the morning it’s as simple as grab-n-go! Click here to purchase a copy of my 7-Day Easy Meal Plan + Recipe Book! This may sounds counter intuitive, but hear me out! If you haven’t been in a routine, you may be tempted to go from zero to full throttle. Thinking you’ll be able to jump into a full time gym schedule may lead to feelings of overwhelm and burn out before the habit has even taken hold. Pull back a little and start with committing to working out just five minutes a day. I recommend movements you can even do while watching TV, such as, foam rolling, squeezing a yoga block between your thighs, or using a yoga strap to get some stretching in. Want to do something that makes your body feel good? When we feel flexible, loosened up, and relaxed, we’re more likely to want to keep those good feelings going by say, going for a walk or trying a workout! For a bit of body therapy, I recommend the Original Worm Foam Roller to all my private weight loss clients. And if you don’t already own a yoga block or strap I love products by Gaiam! Healthy sources of fats like almonds and nut butters are great to keep with you during the day for snacking. They can also be a little too easy to overindulge in, so I advise pre-portioning them out in small to-go containers. You can even buy individual serving sizes of nut butters from brands like NuttZo. Deliciously convenient! Another bite-sized way to achieve your goal of eating healthier is to add one specific food to each major meal of the day. Breakfast – Add a healthy fat such as chia or flax seeds into your oatmeal, smoothies, or yogurt. Lunch– Pack your favorite brand of protein bar to have as a snack after lunch (just make sure it has at least 10g of protein in it)! Dinner– For dinner, simply add in an extra veggie! When a child does something well, you encourage them, right? Whether with hugs or a high-five, it’s a confidence boost that associates a set action with a positive outcome. Treat yourself the same way. Did you do your five minute workout today? Pat yourself on the back! Meal prepped so your nutrition was accounted for all day? Give yourself a big ol’ hug, you deserve it!